The university will host American Legion Boys State through 2021. Hundreds of students will stay on campus May 26-June 1 this year to learn how city, county and state governments function through simulating those jobs. They’ll also participate in Memorial Day services and hear from many local, state and federal elected officials. 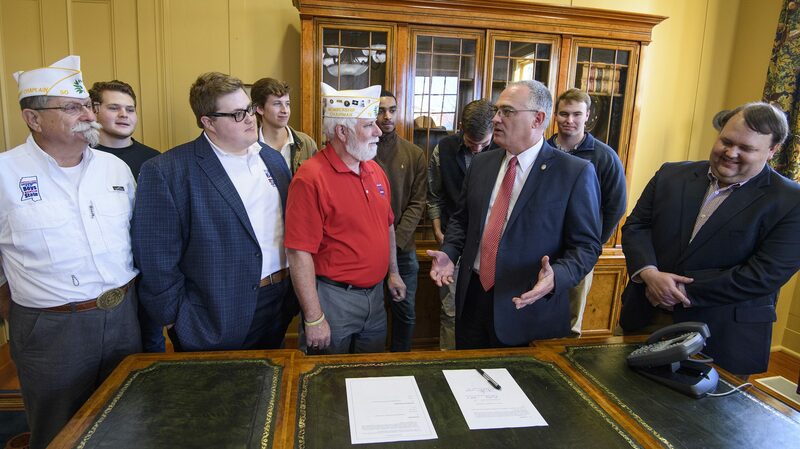 Hunter Pace, director of Mississippi’s American Legion Boys State, said the group is excited to continue its relationship with Ole Miss. Boys State’s goal is to make sure that every delegate understands the value of civic education, and that they have an opportunity to put that education into practice, he said. The Illinois American Legion created the program in 1934, and Mississippi’s began in 1938. The national organization adopted it in 1945. The goal of the program is to show that democracy needs both an intelligent citizenry and also a moral, honest and impartial administration that is responsive to the will of the people. The nonpartisan program is conducted each year across the country through each state’s Department of the American Legion. It’s estimated that more than 28,000 young men annually participate in the civic workshops. Brandi Hephner LaBanc, UM vice chancellor for student affairs, said it’s a privilege to work with Boys State to provide a rewarding opportunity for many of Mississippi’s future leaders. The gathering is designed to be a virtual 51st state with a constitution, statutes and ordinances constructed by its citizens to govern themselves. Participants are required to review their knowledge about political workings of state and local government, but they also perform the same duties as real-world officeholders.